Well, here’s an interesting find. Rarely does a game appear on my “upcoming” list with no one ever having commented on it, no one saying he was looking forward to it, and so forth. 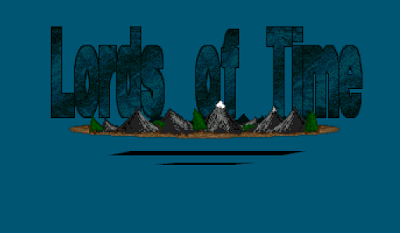 What makes this all the more unusual is that Lords of Time is a clear successor to a game that, eight years later, I still get grief for prematurely abandoning: MicroIllusions’ Faery Tale Adventure (1987). 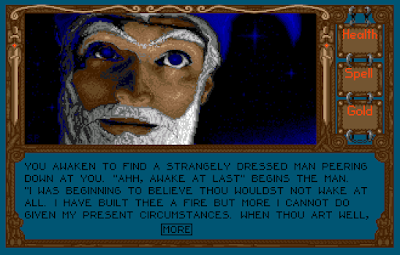 Lords‘ nominal developer is Steve Postma, not Adventure‘s David Joiner, but the development company, Hollyware, was reconstituted from the remnants of MicroIllusions, and it’s easy to see Postma being passed the existing code and engine and asked to create a new title. The intervening five years have produced some growth in that engine. The axonometric perspective is the same, but the graphics are a bit better. There are more sound effects. Adventure‘s attributes–bravery, luck, kindness, vitality–have been replaced with a more standard set of RPG attributes: strength, dexterity, and intelligence. The inventory system is improved. 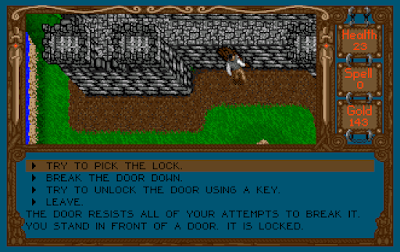 But the joystick-based interface and the extremely basic combat system haven’t changed a bit. 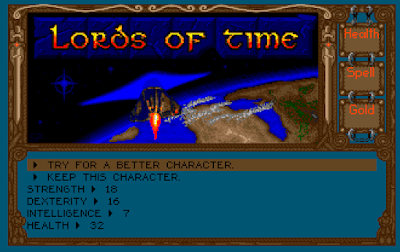 Neither have some thematic elements, including a pre-defined main character and a largely empty game world. It was that latter element that sunk my interest in the original game; we’ll see what happens here. The backstory is, I feel, needlessly complex. Lord British only needed a moongate to bring the player to Britannia, but here the protagonist–goofily named “Major Thom,” an air force test pilot–arrives in The Realm when a “multidimensional friction propulsion generator” sends him through a “flux anomaly.” He crashes on a primitive planet with fantasy trappings. During a period of semi-consciousness after crashing, he sees a vision of an old man, who tells him to seek out the “human king Tanor.” He awakens to find a dagger and a Bag of Holding and sets off. Couldn’t I have just gotten there by magic? That works for other franchises. And he’s almost immediately killed. 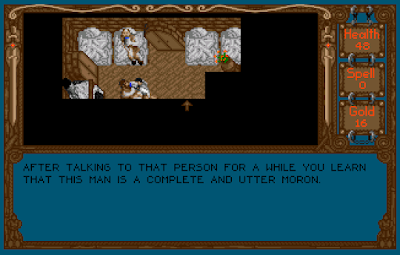 The initial stages of the game are laughably difficult. 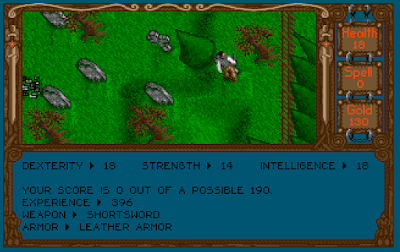 The character gets attacked by randomly-spawning spiders, fighters, and undead within seconds of start-up, and he has only a flimsy dagger to protect himself. (And when I say “spawn,” I mean they literally grow up from the ground right in front of you.) There are environmental menaces such as man-eating plants that kill you instantly if you wander into their radiuses. Spiders can inflict poison, which you have no way of curing. I must have reloaded 20 times in the first 10 minutes. 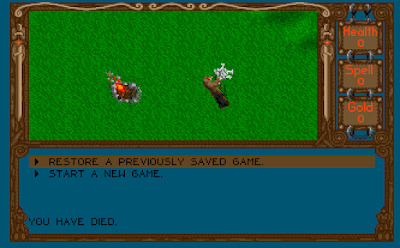 (Fortunately, the game allows quick-saving in memory rather than just saving to disk.) The only advantages Thom has are an ability to run slightly faster than his enemies and slow regeneration of health as he runs. Not a very hospitable planet. 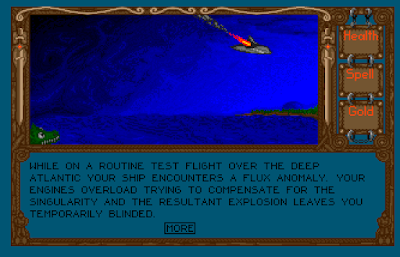 The game comes with a map, but at the beginning you have no idea where you’ve crash landed, and in true Faery Tale Adventure tradition, the scale of the game window is extremely small. It could take easily take 30 minutes in real-time to cross the continent, even with no obstacles. I later figured that I’d arrived just east of the Dark Forest, in the southwest-central part of the map, but that was only after I made my way down to the coast and started feeling along the edges. Oh, and the character needs food and gets hungry during this process, too. On my first attempt, I was starving by the time I made it to Murkvale, and I only had time for a few conversations before I died. 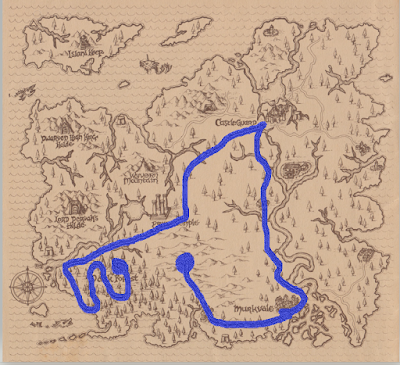 The game map, with my travel route this session outlined in blue. Combat involves simply pressing the FIRE button on the joystick, which waves your equipped weapon in the direction you’re facing, hopefully hitting an enemy. Sometimes subtle matters of distance and alignment prevent you from connecting (but, of course, not them from hitting you). Later, I guess there will be spells. I hope they supply a greater tactical challenge. The rest of the interface is a little more complex than Adventure. 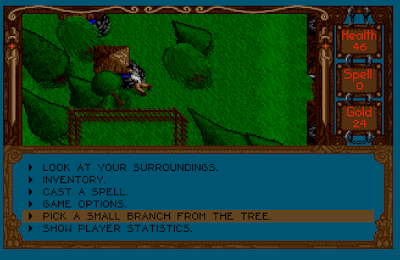 Certain commands are always available, such as look, cast, search, and game options. These can be activated with individual keys, and hitting the SPACE bar brings up a menu with all available commands. The neat thing about the SPACE bar menu is that it also has contextual commands, based on where you’re standing and what you’re facing. Such commands might include drink from a well, read a sign, or search a cabinet. I’m not sure why I need a branch from a tree, but the option is there. On my second attempt, I made it to Murkvale before I died. 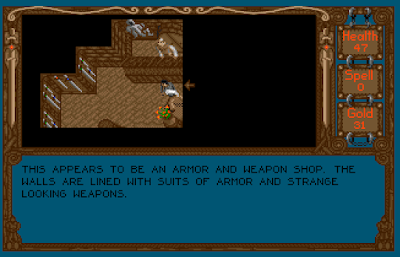 The town has a tavern, a bank, an inn, a magic shop, and an arms and armor shop. It took me a while before I discovered that food, weirdly, is sold at the arms and armor shop. A portion of waybread costs 10 gold pieces, so I wasn’t able to buy much at the outset. I bought enough to sate my stomach and consider my next move. A lot of the areas have text descriptions as you enter. In towns, walking up to people causes an interaction interface to activate automatically, giving you various contextual options depending on the person. In the tavern, there were a few people I could converse with and get tips. 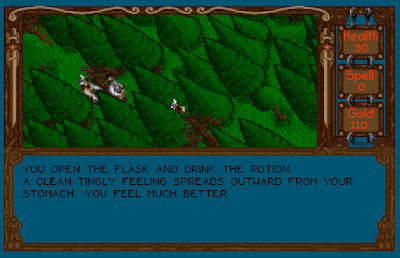 I learned that enchanted dwarven armor is second-to-none, dragonsbane can be found in the mountains, and “Restoration” cures poison as well as restoring health. Towns also have private residences that you can loot (I’m not sure if there’s any penalty; there wasn’t in Adventure) and sleep in their beds. Not all conversations result in hints. From Murkvale, I followed the river north to what was marked on the map as a castle. (It’s one of two, but the other specifies that it’s a dwarven castle.) A town called Castleguard sat at the feet of the castle. To enter the town, I had to get past a guard with various options for persuasion and bribery. The first one I encountered, at the south gate, wouldn’t believe any of my excuses, but when I told the north guard I was there to purchase items, he waved me through. 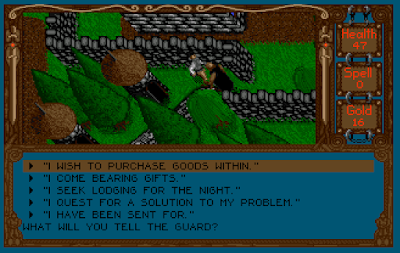 The town largely had the same types of services as in Murkvale. The guard wasn’t impressed with any of my excuses. I managed to find a suit of plate mail in one of the houses. Rather than wear it, I sold it for enough money to buy a short sword, some leather armor, and some more food. I had enough left over to bribe the guard at the castle gate, which was the only way I could get in. 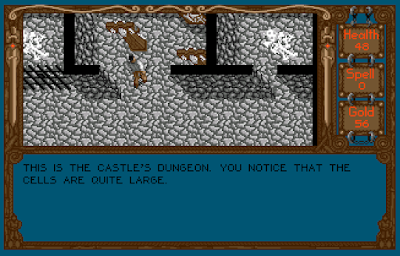 The castle has a small dungeon. I think putting stocks inside a cell kind of misses the point. Inside the castle, the king asked if I was the “one who rode in on a pillar of flame from a distant land.” I said I was. 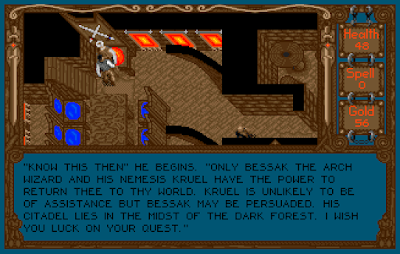 He said that only the archwizards Bessak and Kruel are able to help me return home, and between them only Bessak is likely to help. He lives in a citadel in the Dark Forest, where I just came from. I was a little disappointed that the king didn’t give me a more locally-relevant quest, or explain how he knew I’d arrived, or explain why he was interested in helping me, or really anything. The king’s court consists of a king and one guard. I remember this emptiness characterized Faery Tale Adventure. I slept, awoke in the dark, and started heading back to the Dark Forest. I soon discovered that not all enemies can be outrun. In particular, some kind of wolf or hound is more than capable of keeping pace. Moreover, when you get to an area dense with objects, like a forest, difficultly navigating around the trees means that even slow enemies can usually catch up with you. I must have reloaded two dozen times. It’s easy to get lost, stuck, and swarmed with enemies in the forest. Eventually, with some systematic exploration, I found what I think is the citadel. But the main door is locked and resistant to my attempts to bash it. This is where I leave off the first session. If I can’t figure out something in the area, I’ll start systematically exploring the other towns and keeps on the map. Unfortunately, I have no keys or lockpicks. I’m not sure about character development. I’ve been earning experience points, and my max hit points seem to have increased, but this isn’t like Faery Tale Adventure, where every successful combat directly raises your attributes. I’ve found a couple of “Increase Attribute” spells, but I don’t have the ability to cast them yet. The manual suggests I need to find various guilds to learn martial and magic skills. I’m also not sure about the “score” business. It’s an interesting RPG that I was in no way expecting. This is what I was looking forward to in 1992. PREVIOUS POST Previous post: Island of Dr. Brain – Won!